But he’s already made it plain how to live, what to do, what God is looking for in men and women. It’s quite simple: Do what is fair and just to your neighbor, be compassionate and loyal in your love, And don’t take yourself too seriously— take God seriously. No carved gods of any size, shape, or form of anything whatever, whether of things that fly or walk or swim. Don’t bow down to them and don’t serve them because I am God, your God, and I’m a most jealous God, punishing the children for any sins their parents pass on to them to the third, and yes, even to the fourth generation of those who hate me. But I’m unswervingly loyal to the thousands who love me and keep my commandments. But I’m lovingly loyal to the thousands who love me and keep my commandments. Know this: God, your God, is God indeed, a God you can depend upon. He keeps his covenant of loyal love with those who love him and observe his commandments for a thousand generations. His loyal love goes on forever! Yesterday, I felt like I could run a marathon. I clicked that exercise DVD off and felt strength, like my limbs had grown long and powerful in 30 minutes. I was a lean, mean, health machine who laughed at crunches and slammed through jumping jacks with precision and ease. Today, I was about to throw my running shoe at the TV screen because that guy in the t-shirt and gym shorts wouldn’t stop jabbering. Couldn’t he see I was short on oxygen after just 5 jogs in place? When someone is suffocating right in front of you, don’t you bypass the small-talk and incessant chatter and tell them to skip to the end already and go have an ice cream cone or something? Some days choosing blueberries and yogurt with granola comes easy. Other days I need chocolate so bad I want to order a hot fudge sundae from McDonald’s–hold the sundae. Isn’t so much of life like this incessant movement back and forth and back and forth, making progress, stumbling, feeling accomplished, feeling like giving up? Some days I’m attacking that to-do list with energy and focus. The next day I’m distracted and just want to play hookie from grown-up life. Some days I’m relaxed, spontaneous, fun mom. The next day I snap in half when three of my kids demand that I help them right this second, now, now, now as if they can’t see with their own two eyes that I only have these two hands. What is this roller coaster life I lead? Why these fickle whims and why is perpetual progress so elusive? She says, “When you don’t know what God is doing, you can find stability in Who He is” (p. 112). Moses looked right past that burning bush. Sure, it caught his eye, but he glanced at the bush so he could gaze on God. That compelled him into perseverance, into pushing past the fear and insecurity, pain, anger, the possibilities and probabilities of failure, and the overwhelming threat of the unknown. I admit it. Sometimes I flop down in the middle of these circumstances and think—this is what God will do. This is how God acts. But He’s so much more creative than little ol’ me and those unexpected ways of His send me into spirals of doubt and worry. Why isn’t God doing what I want Him to do, when I want Him to do it, how it makes sense to me? That wobbly faith of mine, it’s revealing the cracks in the foundation, how I’ve trusted in what God does, not Who He is. I think of the farmer in the parable, sowing that seed on the rocky soil, on the path, among the thorns. And I think how I’m fickle here, too. I’m this avid gardener in April and May. But come July, one summer rainstorm sprouts a rain forest right in my front yard. I walk out that door and step into a mighty jungle that has grown to towering proportions overnight. And a girl just can’t keep up with that, not in the mid-summer Virginia heat and humidity. The weeds choke out those tended and welcome plants, just like that parable says. the seed on good soil stands for those with a noble and good heart, who hear the word, retain it, and by persevering produce a crop (Luke 8:15 NIV). 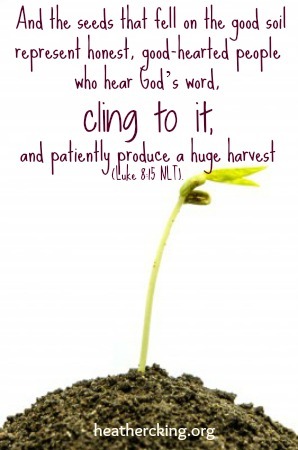 hear God’s word, cling to it, and patiently produce a huge harvest. Look past the burning bush and fix those eyes on Jesus, on WHO He is, constant in every situation. And hold on for dear life to God’s Word, not letting those fingers fall loose for one second. That’s what prompts our hearts into patient perseverance. That’s what produces this abundant crop of a harvest if we just don’t give up. Weekend Rerun: I’m Not A Boy! I’m not a good dancer. I’m not easily offended. I’m not a blonde or a red-head. I’m not artistic. I’m not quick to cry. I’m not much of a TV watcher. I’m not from a small family. I’m not a quick decision maker. Is it any wonder that God has a list, too? His “ams” and “am nots” through Scripture establish His character and give us reliable assurances in times of trouble. It’s the most powerful declaration of God’s identity in Scripture, when He tells Moses His name: “I AM WHO I AM . . .This is my name forever, the name you shall call me from generation to generation” (Exodus 3:14, 15). He is I AM and I WILL BE. He is eternal. He has existed before our human history began and He has walked through the entirety of our time on this planet and will still remain forever. So, we can trust Him. We can place in His capable hands all that frightens us because He knows where we have come from and where we are headed. “I AM with you” (Genesis 26:24). “I AM God Almighty” (Genesis 35:11). “I AM the LORD, who heals you” (Exodus 15:26). “I AM the LORD your God” (Exodus 16:12). “I, the LORD your God, am holy” (Leviticus 19:2). “I AM the LORD, and there is no other; apart from me there is no God” (Isaiah 45:5). “I AM the LORD your God, who teaches you what is best for you, who directs you in the way you should go.” (Isaiah 48:17). “I AM the LORD your God, who stirs up the sea so that its waves roar—the Lord Almighty is His name” (Isaiah 51:15). Can you read through this list of what God says about Himself, His “I ams” and not be in awe, not be filled with the desire to worship, not be comforted? He is with you, there in the places of hurt and despair. He heals you. He is holy. He is your Savior, pulling you out of the pit and redeeming you through the blood of His Son. He is the only God. He directs our steps. He is Lord Almighty, in control of all creation, including the circumstances you find yourself in. He doesn’t stop there, though. He also has “am nots.” Just as powerful, these are declarations of His dominion over all the fake gods that vie for our worship. Not our God. He made His dwelling among His people, directing them to “make a sanctuary for me, and I will dwell among them” (Exodus 25:8). He abandoned the glories of heaven and “The Word became flesh and made his dwelling among us” (John 1:14). The idols of the nations are silver and gold, made by the hands of men. They have mouths, but cannot speak; eyes, but they cannot see; they have ears, but cannot hear nor is the breath in their mouths. Our God is the Shepherd who speaks to His sheep (John 10:27). He is the God who sees us (Genesis 16:13) and hears our voices when we call to Him (Psalm 5:3). And our God “is not human, that he should lie, not a human being, that he should change his mind. Does he speak and then not act? Does he promise and not fulfill?” (Numbers 23:19). It may feel difficult at times to believe in God’s nearness, responsiveness, concern, love and faithfulness because we are immersed in a pit of circumstances that blocks our view of Him. And yet, He tells us all the things He is and all the things He is not and it is that Scriptural assurance of His character to which we cling. We can rest in safety knowing that He is I AM. We can rest in safety knowing all that He is not. 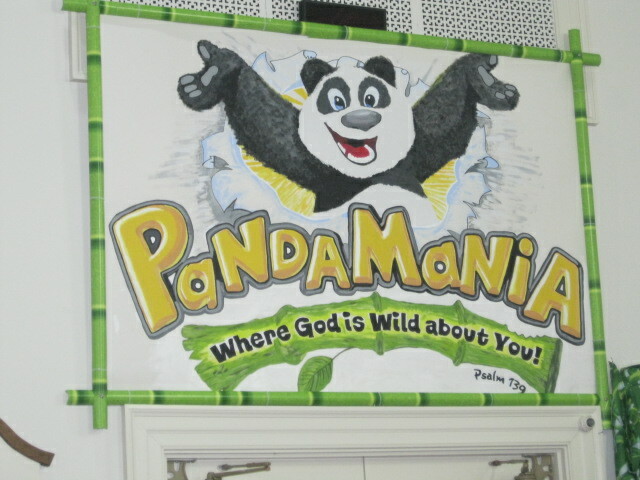 This week I’m going through the lessons of Group’s PandaMania VBS and considering how they apply to more than just kids! Last week, I quietly explained to my oldest daughter that even though people are friendly and strangers ask her questions, doesn’t mean they always have time for her entire life story. Perhaps not everyone can listen to everything she has to say. Thus, when a friendly cashier asks how old my kids are, they give an unabridged biography as an answer. And when the lady cutting their hair asks where they go to school, the girls launch into a weekly schedule that lists off all their normal activities and then give an infomercial about their preschool and kindergarten. Kids can tell you exactly what it’s like to be ignored or unheard. They know what it feels like to talk to a busy parent or teacher, who responds with a distracted “mm-hmm.” They’ve been that hand, waving in the air, that didn’t get called on to share an answer. And even when someone is tuned in, kids may not have the words to express what they’re feeling. . . . God not only hears our voice . . .God hears our heart! There’s a powerful promise buried in this simple lesson—God Listens to You. Just like my kids may sometimes feel like I’m not listening closely enough, there are times when I feel as if God has gone deaf or, even worse, is choosing to ignore me. I’m not alone in this prayer. David asked, “Hear my prayer, O God; listen to the words of my mouth” (Psalm 54:2) and “To you, LORD, I call; you are my Rock, do not turn a deaf ear to me. For if you remain silent, I will be like those who go down to the pit” (Psalm 28:1). Asaph prayed the same: “God, do not remain silent; do not turn a deaf ear, do not stand aloof, O God” (Psalm 83:1). He hears what we pray. He hears our heart’s cry even when words escape us. During the tough times, heaven may seem silent and our prayers may seem to bounce against a ceiling rather than land at God’s feet. Regardless of how you feel, though, you can trust in an attentive God who hears the prayers we offer on our knees, the whispers as we lie in bed at night, the tears as we fall in despair in His presence. God listens to you. We know this because God doesn’t change. From beginning to end, from person to person, our God is consistent in His character. So, just as He threw down fire from heaven in response to Elijah’s prayer, so He hears and responds to our cries for help. In 1 Kings 18, Elijah challenged the 450 prophets of Baal and the 400 prophets of Asherah not just to a test of their gods’ power, but also of their gods’ ability to hear them. He declared, “Then you call on the name of your god, and I will call on the name of the LORD. The god who answers by fire—he is God” (1 Kings 18:24). God’s character–the things that sets Him apart–isn’t just that He is able to deliver us; it’s that He truly hears our cries for deliverance. And so the prophets of Baal danced and shouted. “At noon Elijah began to taunt them. “Shout louder!” he said. “Surely he is a god! Perhaps he is deep in thought, or busy, or traveling. Maybe he is sleeping and must be awakened.” So they shouted louder and slashed themselves with swords and spears, as was their custom, until their blood flowed. Midday passed, and they continued their frantic prophesying until the time for the evening sacrifice. But there was no response, no one answered, no one paid attention (1 Kings 18:27-29). Their god was silent. Their god was deaf. Their god was unimpressed by their passion and unresponsive to their cries. Elijah sloshed water all over the altar so it was running down over the soaking wet sacrifice and spilling onto the ground below. He prayed, “‘Answer me, LORD, answer me, so these people will know that you, LORD, are God, and that you are turning their hearts back again.’ Then the fire of the LORD fell and burned up the sacrifice, the wood, the stones and the soil, and also licked up the water in the trench. When all the people saw this, they fell prostrate and cried, ‘The LORD—he is God! The LORD—he is God! '” (1 Kings 18:37-39). Be assured of that today and rest in that promise. Remember that what defines God is that He is alive and active, powerfully able, and mercifully responsive to us.